General Eisenhower made the announcement: “The Italian government has surrendered its forces unconditionally. . . Hostilities between the armed forces of the United Nations and those of Italy terminate at once.” The head of the Italian government, Marshal Badoglio, made the same announcement on Italian radio. Eisenhower went on to say that the Allies would support any Italians who acted to repel the Germans from Italian territory. 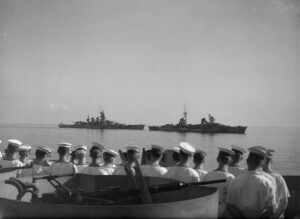 Hitler had anticipated the threat and was already strengthening the German forces in Italy under Kesselring’s command. He launched Operation Axis with the intent to occupy Italy. Badoglio and the Italian royal family fled Rome for the safety of the south. As for the Duce: He was still under arrest and being held at the Campo Imperatore hotel on the Gran Sasso massif. By the end of the week, 12 September 1943, he was freed by German paratroopers and SS special forces who landed on the mountain top by glider. 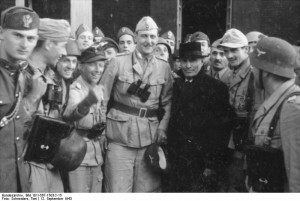 The SS leader, Otto Skorzeny, achieved worldwide fame for engineering the daring rescue (which was praised by Winston Churchill). Mussolini (with Skorzeny) was flown to safety in Storch light aircraft. He landed near Rome and then flew on to Vienna. This entry was posted in World War II and tagged Badoglio, Italy, Italy surrenders, Mussolini, Skorzeny. Bookmark the permalink.